The demand for high-performance talent at Ford these days in exceeded only by that for aerospace workers on the West Coast. In other words, business is slow. In spite of total factory withdrawal from all facets of motorsports, there still are those daring young men who continue to run their Fords. 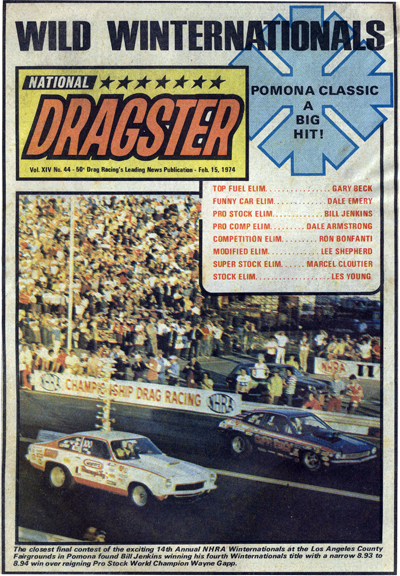 And as far as drag racing is concerned, that tenacity has dammed the mainstream of things-particularly the three year dominato of Pro Stock by Chrysler and Chevrolet. 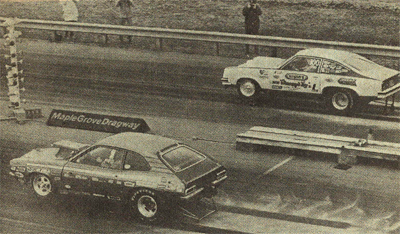 But since the outset of the ’73 season, Fords have placed at more major NHRA meets than all other brands combined. Spearheading this now completely independent effort are Don Nicholson, Ken Dondero, Gapp & Roush, Glidden & Allen and, most recently, Don Grotheer. 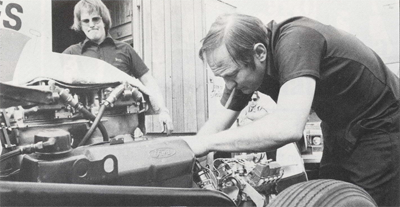 Perhaps most instrumental in the research and development of the the Boss 351 for drag racing are ex-Ford engineers Wayne Gapp and Jack Roush. 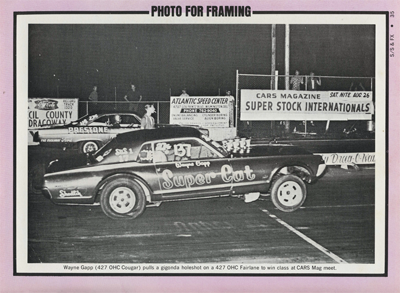 When race budgets were cut way back and then dropped altogether, factory performance people like Gapp and Roush retired to modest buildings on the outskirts of Detroit to devote their time and effort toward the preservation of the Boss 351 for Pro Stock. Of course, when you work for an auto maker in engine development and manufacturing, certain information and parts connections are readily available. Wayne and Jack were careful not to burn any bridges and escaped to the suburbs with the last of many good pieces that were originally designed specifically for their application. And now that Ford’s Off Highway Only parts program also has folded, neat things like aluminum water pumps, stiffer oil pump springs and trick lightweight valves are next to impossible to come by. 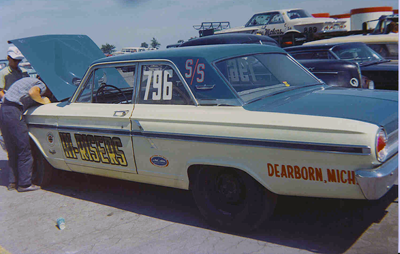 Whereas the Chrysler Pro Stock contingent relies almost exclusively on factory-developed parts, the Ford camp was split into what some called the “California combination” and the “Factory Way.” Nicholson was responsible for achieving his performance levels through heavy usage of the California aftermarket industry, while Gapp & Roush trusted factory components and information. Not that their source has been all but exhausted, the Midwest Ford Pro Stock racers are “looking to the West” for help. This means that more consistent parts are being used throughout everyone motors. And, because Gapp & Roush build 80% of the Pro Stock Pinto engines and a fair share of the Modified renditions, what could be more representative of the current state of the art than to take a tour through one of their 152 mph Boss 351’s? Remember that the following information applies to the Modified Production and those classes accepting unlimited internal alterations in AHRA and IHRA. Generally, the Boss 351 has its good and bad points. The cylinder head is as efficient as any unleaded rat motor unit but weighs a hefty 53 pounds. In fact, an entire 351C motor is within 20 lb. 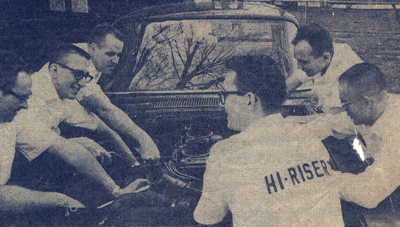 of an aluminum-headed big-block Chevy. Another detriment for racing is the block itself. While the thin wall casting process benefits cooling, those same think walls present a problem when core shifts further reduce their thickness. Cracked cylinder walls are common when the block is opened up .020 inches for Pro Stock application. 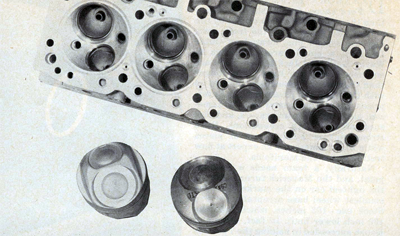 But a good mark is logged for Ford’s penchant for sealing, as the Cleveland engines are virtually airtight. To begin with, Gapp & Roush suggest you forget anything you may have heard about the Boss 351 and its dependability. They have an engine at the shop that hasn’t missed a beat in over 100 sprints down the quarter mile, so one might say they’ve found the secret for longevity. While Gapp & Roush use the standard 4-inch bore, 4-bold main 351C block, they have successfully run the 2-bolt version without difficulty. 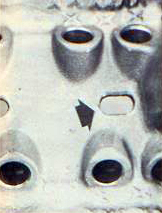 The main caps for both blocks are identical, save for the number of bolts and their placement. We mention this because the 2-bolt main block is cheaper and easier to find. After selecting whichever casting suits you, G & R recommend the usual debarring and a radius around the main journal area at the bottom of each cylinder. They then “Siamese” the two oil return holes nearest the rear of the block in the valley area to promote runoff and “scallop” the intake and exhaust sections at the tops of the cylinders, using a head gasket as a template (see photos). You may recall the bearing problems encountered by Nicholson when he began running the 351. After umpteen spun bearings and burnt cranks it was discovered that his aftermarket oil pump was to blame. 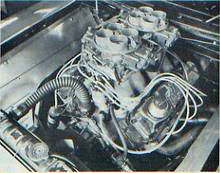 Gapp & Roush have always used the stock Boss pump, but in conjunction with certain modifications to the block’s oiling system. On an engine spinning at over 9000 rpm, maintaining sufficient lubrication to the crankshaft and main bearings is most critical. To promote more efficient oiling to these areas in the 351 Cleveland, the oil galley running from the rear main to the left hand lifter galley is restricted with a 3/8-inch section of coarse threaded rod that is slotted at one end for installation (like a etering jet) and drilled with a .080 inch orifice to cut down on excessive valve train lubrication. Each of the cam bearings gets a similar plug made from 5/16-inch coarse rod and a .060-inch hole. There is no need to drill and tap the front cam bearings, as it is fed from another source and is OK as is. The stock Boss 351 oil pump is then fitted with a heavy-duty spring (P/N D2ZX6670AA) to boost line pressure. G & R claim 125 psi with a cold engine and approximately 60-70 psi at 8000 rpmp once she’s warm. Oil pan capacity is 9 quarts. Depending on the size of the engine they are building, Jack will bore the block .020 inches for a total of 354 cubic inches or leave it standard for use with stock pistons. In either case, G & R use a torque plate and head gasket firmly attached to the block to prevent cylinder flex during the honing process. The last .005 inch is removed with a #820 Sunnen stone to assure concentricity. The stock Boss unit receives only limited attention. Assuming it’s straight, the crank is chucked up in a lathe and widened at the rod journas to accept 327/350 Chevy 2.1-inch bearings (TRW P/N CB826P). Aside from tuftriding, the only remaining operation is enlarging the oil holes to a quarter-inch. Gapp & Roush credit the aluminum rod as the single mos important piece in their motors. Jack states that steel rods have a tendency to “bite” et crank and spin bearings at low oil temperatures. The aluminum version is best fro cold engines, negating warmup time and allowing the motor to be “blipped” as soon as oil pressure has built up. The rod employed is a Brooks Racing Component measuring 6.070 inches verse the 5.875 standard length. G & R purchase rods in unfinished form so they can juggle bore-to-stroke combinations by finish-machining the small end themselves. 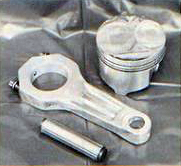 Piston choice is a 13.0:1 BRC aluminum item weighing 595 grams with a full floating Teflon-buttoned wrist pin. Each piston is fitted with a .062-inch compression reigns-a moly top and a ductile iron second-and a 1/8-inch oiler, all from Sealed Power. Contrary to normal procedure, the Gapp & Roush Boss 351 is internally balanced within the block, rather than on the outside via the flywheel and harmonic balancer (ala 454 Chevy). It’s not a difficult operation, especially after the crank ournals have been widened and the aluminum rods added. The crank counterweights are drilled and filled with mallory, a very dense and expensive alloy, to offset the piston/rod mass. Switching to an aftermarket flywheel and machining the stock balancer to bring it back to a non-counterweighted condition complete the process. This is not recommended for street applications using steel rods and stock crankshafts, because the normal car owner would go broke buying enough mallory to compensate for those stock pieces. It is, however, a necessary function for Pro Stock and serious Modified competitors. As mentioned earlier, the stock Boss casting is very effective, due largely to its canted valve design and shallow combustion chambers. But, by the time you add multiple carburetion and high-lift Pro Stock camshaft, the head’s breathing capabilities are sorely taxed. The logical step is to contour both the intake and exhaust ports to “setup” an increase in air flow. When Jack does a set of customer’s heads, he specifies the use of brand-new castings to insure fresh valve guides. He then adds 11/32-inch Chevy valve seals to the intakes only, having noted zero oiling and guide wear on the exhausts after 75 runs. Next in line are the ports themselves. The intake side is tunnel-ported and polished-nothing really trick. But the exhausts are a bit different since the original passage was a compromise for use with cast iron exhaust manifolds in assorted body styles. The scavenging side of the head is ported, polished and recontoured (a fancy term for cutting open and welding closed a runner) to properly align the newly raised port with the custom-made aluminum exhaust plate. (see “Cut and Paste Ports” February ’73 CC). The raised exhaust really cleans up the valve angle, but may present a problem in some cars where the spacer comes close to or actually hits the shock towers. Headers for those applications are a bit trick. Extensive work in the combustion chamber area is precluded by polishing and milling .010 inch off the intake side for manifold fit once the entire head has been surfaced. Valve work consists of seat widths of .060 inch on the intake, .070 on the exhaust; while approach, seat and valve angles are 20, 44 and 75 degrees, respectively, for both sides. The valves used are the factory race items nobody has. The intakes (D0ZX6507A) are hollow stem/stainless steel with 11/32-inch stems and 2.19-inch head diameters. The sodium filled exhausts measure 1.71 inch and can be found under D0ZX6505A (maybe). 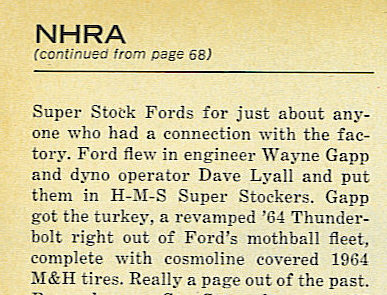 Gapp & Roush suggest you try Ford 427 medium riser valves if the Pro Stock pieces can’t be located. They have 3/8-inch stems and must be shortened about .100 inch to fit the Boss heads, so they will work in a pinch. 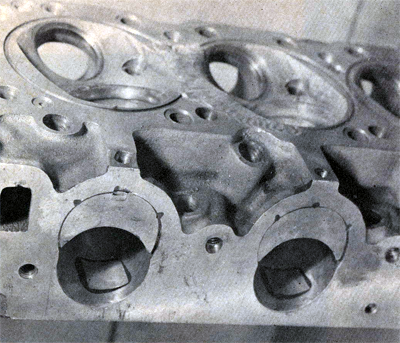 The five-fold head gasket is yet another special Ford item (D3ZX6051AA), consisting of one sheet asbestos, two each of composition and a like amount of steel layers, all sandwiched for a compressed thickness of .038 inch. The heart of Gapp & Roush’s valve train beats with a General Kinetics roller cam containing 321 degrees duration and .721 inch lift on the intake, and 330 degrees and .700 inch of similar happenings on the exhaust. G-K also supplies the 1.65:1 roller rockers and dual valve springs that are installed at 180 psi closed and 525 psi open. Smith Brothers hardened tip pushrods ride on Manley guide plates that have been cut in half to align with the stock Boss studs. Crane roller lifter complete the valvetrain assembly. Lighting the Boss 351’s fire is Accel’s new Breakerless Electronic Ignition kit (BEI) with a 5-degree curve, 10 degrees initial timing and a total of 40 degrees at 2000 rpm. Champion is the plug of choice. Their BL-3, BL-60Y or BL-62Y units are employed, depending on weather conditions. In the event you plan to tackle what we’ve laid out for you, Gapp and Roush recommend the following engine clearances: aluminum rod side clearance-.030 inch; main bearing-.004; rod bearing-.003; piston skirt-to-wall-(TRW) .005 and .010 inch(BRC); top and second ring end gaps-.015 and .012-inch, respectively. Deck height with the aluminum rods is suggeste at .025 inch down in the hole as measured on the flat portion of the piston dome. Even though they run a Lenco trans, piston-to-valve clearance is held to .100 inch on the intake and .140 on the exhaust. There you have it. Everything you need to know in order to build your owne 650 hp Boss motor. The information can be applied to the 302 as well, so don’t think you have to use the 351 exclusively. If you happen to be the lazy type, Gapp & Roush Performance will gladly supply a complete twin to their highly successful combination for $5500. Buying the heads alone (about $800) and doing the work yourself will afford considerable monetary savings-and you can be assured the finished product will definitely fly.